America is unrivaled in our ability to solve tough problems and create bold, powerful solutions. That's exactly what we need to do with the energy crisis we now face. We can become energy independent, while lowering prices at the pump today and developing innovative and effective energy alternatives for the future. We can produce an overwhelming supply of oil and natural gas here at home, and break the stranglehold that foreign countries have on our energy supply, and our economy. And we can be responsible stewards of our environment, protecting the grand beauty and richness of our country without sacrificing our robust engines of growth, expansion, and entrepreneurship. As Newt Gingrich, former Speaker of the House and best-selling author, spells out in stunning simplicity, when it comes to developing domestic energy resources, we can do it all. Isn't it time we relied on American energy for America's security and prosperity? 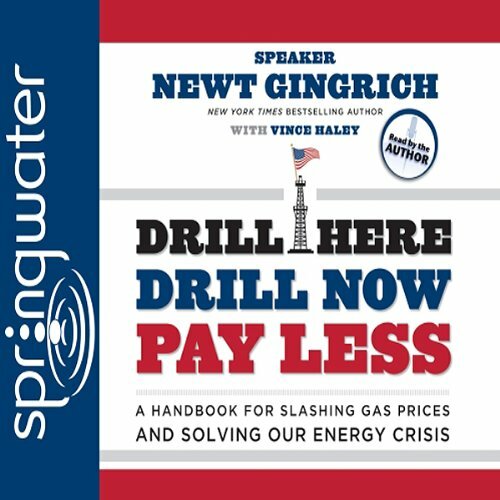 With your help, your citizen action, and Newt Gingrich's plan as laid out in Drill Here, Drill Now, Pay Less, we can solve this energy crisis and slash gas prices, too.